Managing your prospects and existing customers need not be hellish. This is why Spin CRM was purposely designed to bring order to one’s sales management processes. To this end, we are sincerely humbled that a trusted B2B and SaaS review platform recently took notice of the effectiveness of Spin CRM in this endeavor. 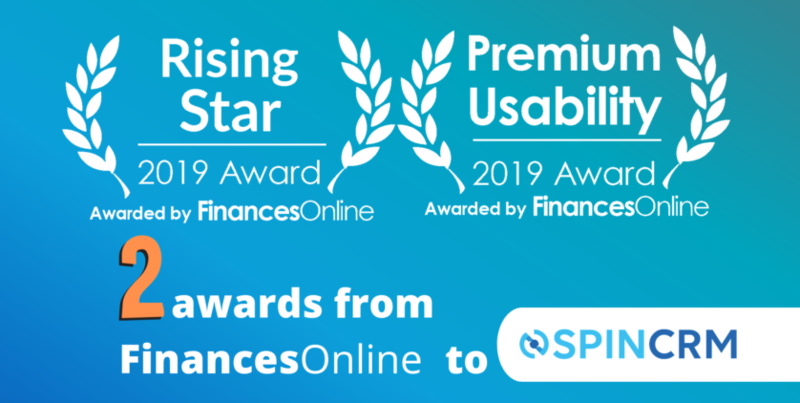 Spin CRM was recently distinguished with two quality certificates from FinancesOnline: Rising Star and Premium Usability award for 2019. The awards were given after a thorough evaluation of our CRM, with the software experts inspecting our straightforward Spin CRM pricing plans, smooth G Suite integration, “feature-rich” CRM and sales management tools, and others. The FinancesOnline platform also attested that Spin CRM is an ideal CRM software for real estate, as it provides users with “every tool you require” to organize, monitor, and maintain prospects and current customers. Coupled with our sales analysis and forecasting tool, users can also gain a clear understanding on their sales efforts and upcoming challenges. Spin CRM garnered a modest 93% user satisfaction score from FinancesOnline. We will get this rating closer to 100% in the near future as we delight our clients with improved tools that help them better stay on top of their customers and client interactions compared to other CRM software examples. Browse FinancesOnline to see their full analysis on Spin CRM. It’s quite a read, with the software experts detailing the benefits it provides to businesses and the various problems it can solve, among others.